Upon completion of the programme, management trainees will embark on their journey to a successful career along this career ladder. 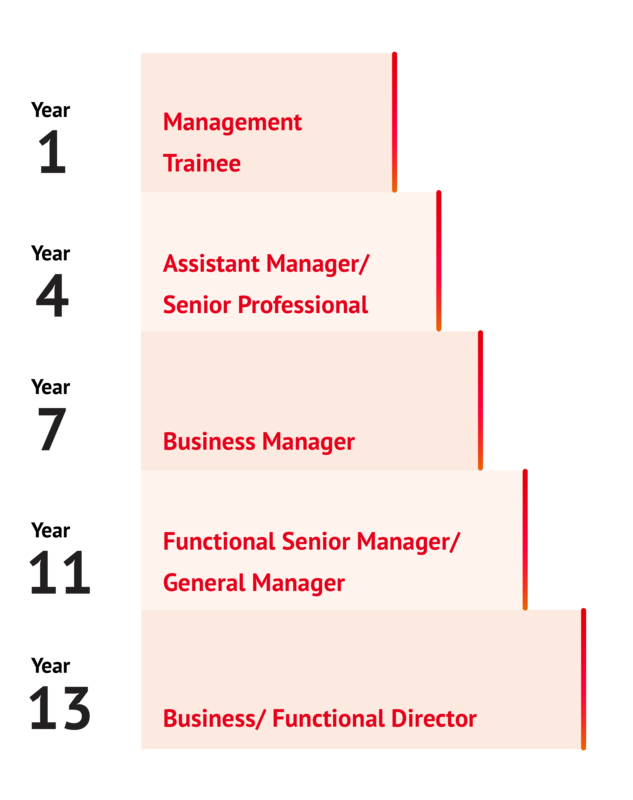 Over the years there are many graduates who came through the Management Trainee Programme and became leaders and all-round experts in their chosen areas. Below are two videos telling stories of three SHKP Management Trainees, offering a glimpse of what the Programme is all about. With a decade of experience working in the company specializing in office leasing, Natalie shares with us the experiences she most cherishes working at SHKP and being a proud graduate of the Management Trainee Programme. Understanding clients’ expectations on the quality of life is central to what Elee does, she believes. That is why she relentlessly learns and expands her horizon, through training programmes SHKP provides and classes she takes at her leisure time. Copyright © 2018 SHKP. All rights reserved.